Windows Live Safety Center is free web service that ensure the health of your PC by scanning to get rid of viruses, spyware, malware, potentially unwanted software, vulnerabilities in your Internet connection and other threats. 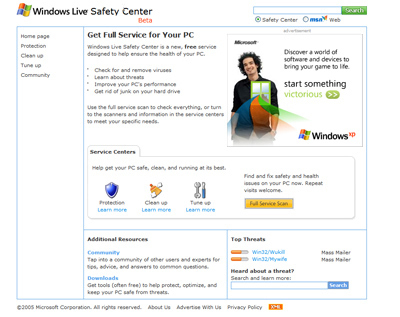 Windows Live Safety Center is part of Windows Live service from Microsoft. Beside ensuring the safety of the PC, Windows Live Safety also helps the PC to be clean and running at its best by cleaning up the junks and unwanted stuffs and tuning up PC by defragmenting. To use Windows Live Safety Center, you must access the website http://safety.live.com/ and install Windows Live Safety Center Scanner ActiveX control. The Complete scan of “Full Service Scan” looks for common PC health issues such as viruses, spyware, potentially unwanted software, wasted space (disk cleanup), PC performance, maintenance issues (defragmentation), secure Internet connection, open network ports scan and invalid registry items scan. Beside comprehensive scan, you can opt for Quick scan which will only check your system for viruses and spywares and other potentially unwanted software. For advanced users, they can customize the scanning options to their liking. One limitation to the Windows Live Safety Center is that the scanner does not run periodic scans of the system, and does not provide real-time features to prevent viruses or spywares to infect the computer system. Other than scanning and cleaning the Windows PC from viruses and spywares, Windows Live Safety Center also provides Windows Live Safety scanner for Windows Live Messenger (Messenger 8.0). 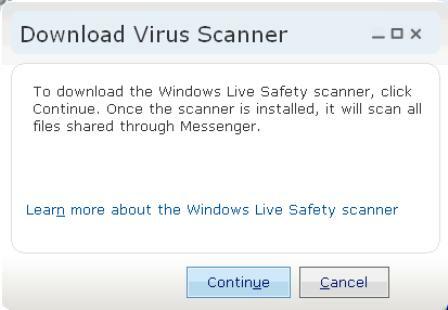 The Windows Live Safety scanner automatically checks for the latest virus signature files from Microsoft and installs them as needed, and it will scan all files that are shared through Messenger. To send and transfer a potentially unsafe file in Windows Live Messenger, Windows Live Safety scanner is a must for file sharing to work. Once you initialize the transfer, Messenger will prompt you to download virus scanner. The virus scanner must be installed and enabled before the file can be shared and sent. Click File Transfer, and then click Install. Click Continue to install the Safety scanner. If the scanner already installed, just check (select) the box for “Scan files for viruses using:”. Note: Winodws Live Safety Center is subsequently renamed Windows Live OnceCare Safety Scanner, and then replaced by Microsoft Security Essentials.